If arriving on Sunday 11th April the Mathematics Department will be closed. Please go directly to the Rootes Building where you can check in to your accommodation at the desk on the ground floor (number 49 on the map). All accommodation is in "Rootes Residences" (numbers 48 on the map), ensuite single student rooms a short walk from registration. Dinner is not provided Sunday evening, but if hungry food can be found on campus in the Arts Centre (number 61 on the map) at Cafe Bar until 19:30, or just off campus there is The Varsity which serves food until early evening. If it's a quiet drink you're after on Sunday your best bet is "The Bar", which is in Rootes Social Building where you checked in to your accommodation. All registration for the Study Group will take place on Monday at the Mathematics Institute, but the Study Group local organiser will be hovering about on Sunday evening near Rootes reception or The Bar in case there are any problems. 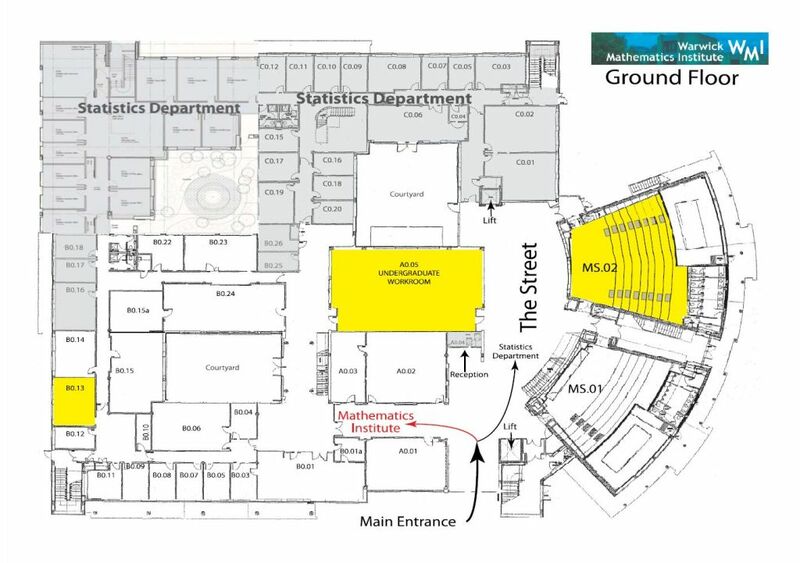 Please register in the Mathematics Institute (building 35 on the map) from 8:45am on Monday morning. We aim to get started with welcoming remarks in the main lecture theatre in the same building (MS.02) at 9:45 so we can start on the problem descriptions by 10am. There will be signs pointing you in the right direction! It will be possible to register throughout the day if you are arriving on the Monday and are pressed for time. 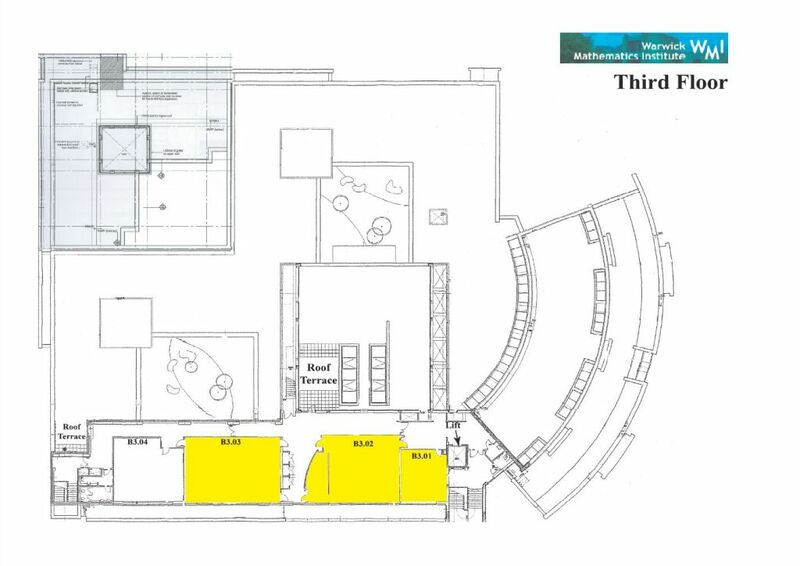 All the rooms used for the Study Group are located in the Mathematics building. 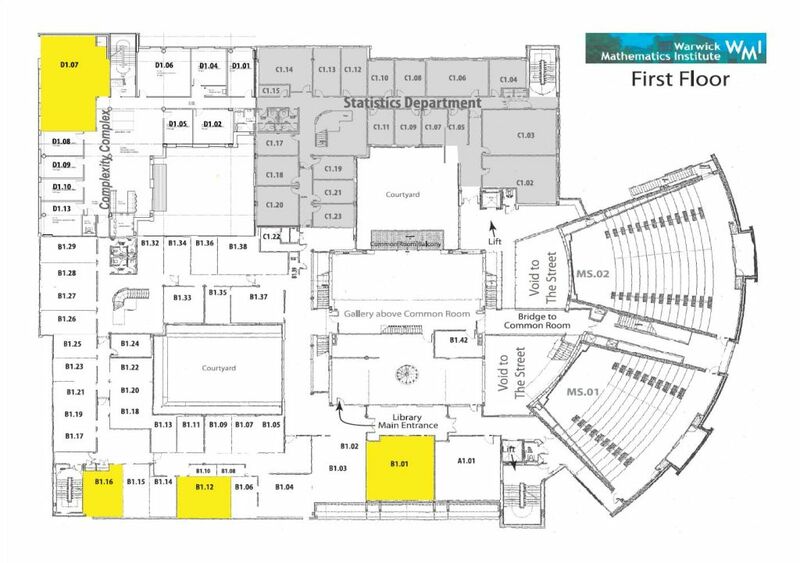 The presentations on Monday, Wednesday evening and Friday are all in the main lecture theatre (MS02), and the rooms for working on the problems are located on the ground, first and third floors of the building. These will be clearly signposted, but all are easily located from the central staircase within the department. All coffee, lunch and tea will be served on the ground floor of the Mathematics Institute in the "Undergraduate Workroom". Please be aware that for the first few days there is a statistics conference happening at the same time in the building and they will be having refreshments and lunch in the main area outside the lecture theatres ("The Street"). There is a programme which is likely to be accurate for most of the week. On Monday there will be a wine reception and buffet dinner in the Undergraduate Workroom in the Mathematics Institute (same room as coffee, lunch and teas have been during the day) starting at 18:00. All particpants are welcome to attend. On Tuesday and Thursday dinner is provided for resident participants in the Rootes Social Building at 19:30 (where you have breakfast). On Wednesday we have a "conference dinner", in a private room at Scarman House (number 50 on the map). This is open to non-resident participants (including Warwick participants) in addtion to those staying on campus who will be asked to confirm attendance if non-resident. Residents will be assumed to be attending. The meal is booked to start at 19:30, but participants are encouraged to make an start in the adjoining bar beforehand. On the Sunday evening there are few bars open and the Rootes Social Building is your best bet (where you register for accommodation), but for the remainder of the week there are several to choose from. Recommended amongst these is the newly opened "Dirty Duck" in the Student's Union, the "only real pub on campus". You will be provided with a login to use the PCs located within the Mathematics Instutite when you register. Those participants with accommodation will, in addition, be provided with a University login which will let you use the hot spots located around the University (including within the Maths building). All accommodation should also be provided with ethernet (remember to bring a cable!). From Campus to Coventry there are frequent buses (the number 12) which arrive and leave from just outside Rootes (marked "B" on the map)... on the way this bus stops next to the train station from where it is a short journey to the centre of Birmingham (via Birmingham International where the airport is located). A taxi from the city centre or railway station will cost approximately 15 pounds. There is potentially a mid-week trip to the Midland Air Museum to escape the "Warwick Bubble" for a couple of hours. Transport would be provided; we are unfortunately not able to cover the admission cost of £5.50, but it is well worth a visit. For those wanting a nice relaxing run first thing in the mornings, please find a collection of local routes from 4 miles upwards by following this link. 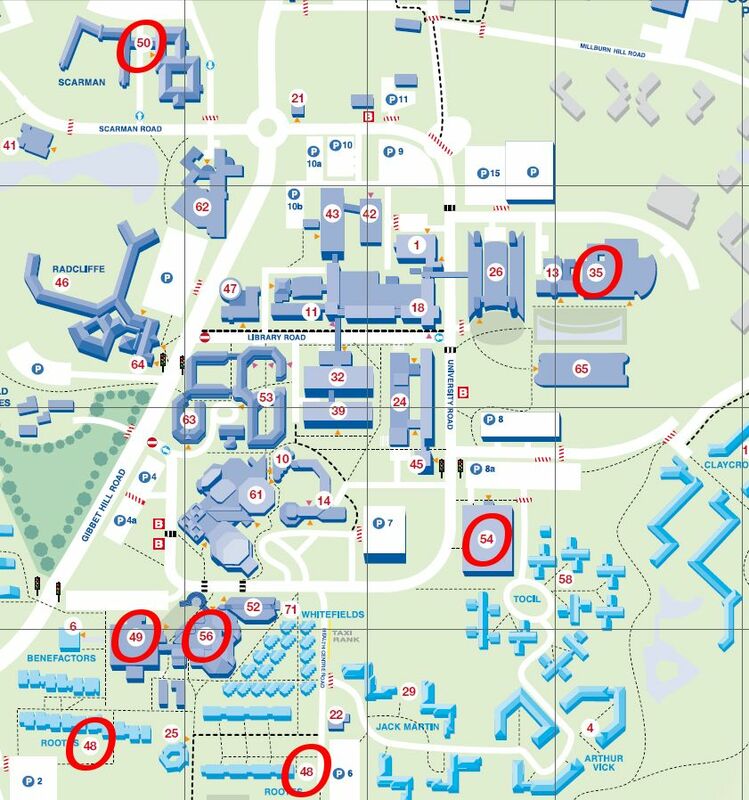 Note also that residents have free access to the University sports centre on campus (number 54 on map) with facilities including swimming, squash, gym and the Bear Rock climbing centre and there is an all weather 8 lane athletics track at another location.